Buy through MusicWeb for £9.00/10.50postage paid World-wide. Arts Archives have put us all in their debt with their valuable series dedicated to the under-recorded Peter Maag. This is now their second issue of performances conducted by André Cluytens. However, while the major companies only sporadically remembered the existence of Maag after his early Decca period, Cluytens recorded regularly and quite extensively for EMI throughout his career, mostly in London, Berlin and Paris. He was not an especially assiduous visitor to Italy so if the RAI archives are to be depended on I doubt if this series will be very long. 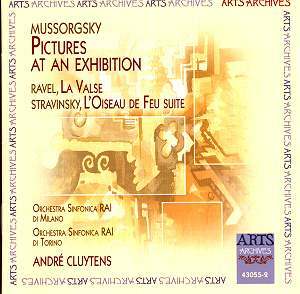 The first issue, a coupling of Debussy’s L’Enfant prodigue with Honegger’s third symphony added two new works to the Cluytens discography; here only the Stravinsky is new and La valse is one of his most famous interpretations. So is it worth it? Perhaps surprisingly, I think it is. Those of us who did our record collecting at budget price during the early 1970s will be well familiar with this conductor’s work. His Beethoven cycle with the Berlin Philharmonic somehow captured critical and public imagination on Classics for Pleasure in a way it had not at full and mid price. Indeed, in spite of a famous “Pastoral” several of the symphonies had not been issued in the UK at all until then. It overtook the Leipzig/Konwitschny as a standard bargain recommendation. His Ravel also won new friends on this label. Yet somehow, he never seemed very exciting. Though likeable and warm-hearted, he seemed smooth and safe in the German classics and rhythmically slack in the French repertoire when compared with Monteux or Ansermet. You got the idea that long familiarity with the Paris Conservatoire Orchestra had bred a degree of contempt on both sides. An exception was always made for two Ravel scores, La valse and Valses nobles et sentimentales, where the naturalness of his rubato and the infectious lilt of his waltz rhythms caused his versions to be longstanding favourites. And yet, when I had the time, some ten years ago, to listen quite extensively to RAI’s re-broadcasts of their historical material, I realized that Cluytens live was a rather different animal from Cluytens in the recording studio. Though I did not review L’enfant prodigue, the performance is known to me and I endorse the praise it has received on this site from Terry Barfoot and Jonathan Woolf. His Milan performance of Schumann’s Rhenish symphony is almost as exciting as that by René Liebowitz. It’s not that his interpretations changed, they just became more communicative and, well, live. I must know his Paris recording of La valse almost by heart so it was a curious experience to hear it emerge virtually identical in its rubatos, its sumptuous string glissandos, its affectionate rallentandos. The different orchestral timbres sometimes provide a new gloss and to be frank, there are spots of precarious ensemble or wonky balance that got sorted out in the studio. On the whole, though, it’s amazing how he gets a recognizably similar style and sound from an orchestra he did not often conduct. In spite of any minor orchestral problems – not that discipline of the Szell-Rodzinski kind was a major concern in the Paris studios either – I think I shall prefer this one now. Somehow you feel that all the interpretative touches are communicated and not just done. The RAI recording is revealed to be very fine, more vivid that the CFP LP, but this comment may not apply to EMI’s CD transfer. At the beginning of Pictures you will note that the Milan trumpeter not only uses a degree of vibrato not favoured in the UK, but has a narrow-bore instrument nowadays associated with military bands. This differentiates him from his French colleagues of the day. As a matter of fact, the Milan RAI orchestra was still sporting this style of trumpet playing when I came out here in the mid 1970s, though on this same disc it can be heard that the Turin orchestra already had more “normal” trumpet players. The very opening is a bit precarious and it is noticeable all through that this type of instrument does not blend into the brass choir very well. On the other hand the nasal, whining sound is a plus for Samuel Goldenberg & Schmuyle. I feared for the man as this tricky piece of tonguing began but he gets through without tripping up. We might note at this point that one of the reasons why Cluytens got instantly good results from third rate orchestras was because he seems to have known the exact tempo at which things like this can be done. And so it is with the whole work. It’s a piece with all kinds of traps, exposed solos and the like, but nothing goes seriously awry. Furthermore, there’s such spirit and a conviction to it all that I haven’t enjoyed an orchestral Pictures so much for years. The Turin orchestra was always the best of the RAI bands, and the most European in sound – not just because of the trumpets. Cluytens would not, I think, have attempted a hard-hitting virtuoso performance of the Stravinsky even if he had the Chicago Symphony in front of him. He sees the music as a natural development from Ravel and goes in for warm phrasing and impressionistic washes of colour. By the end the playing is pretty incandescent. This item comes from the same concert as the Debussy on the previous disc – not the Honegger, as the notes suggest. Terry Barfooot noted that the audience was a shade less well-behaved in the Honegger. I can explain that there would certainly have been a more fashionable public present than was normal in these radio concerts, and they had come to hear Rubinstein play Brahms 2, not that horrible modern thing! Recommendation for this type of disc really boils down to what sort of listener you are. I suppose that, as a result of having lived in Milan so long, attending many concerts with the RAI orchestra, good, bad and indifferent, and having witnessed its decline and demise, I tend to have a certain affection for it and to be indulgent when it’s clearly having a good day, as it is here. If you’ve lived all your life in Cleveland or Boston maybe you’ll feel that the excitement of a live concert isn’t incompatible with pinpoint precision. In which case I doubt if Cluytens’ studio recordings with the Paris Conservatoire will be for you either. Arts Archive clearly believe that, in an age of chromium-plated efficiency, there is a public interested in recapturing past times when the spirit was what mattered. I belong to that public and I hope some of my readers do too. And there is also, perhaps, a public with an interest in the conductors who shaped the 20th century postwar scene and would like to get a rounder picture of them. These performances will certainly surprise anybody who has typecast Cluytens on the basis of some of his sleepier studio recordings. That being so, I hope we will get more. The Schumann Rhenish and the Brahms 2 with Rubinstein would fit neatly onto one CD. In Naples, again in 1962, Cluytens conducted Mozart’s Concertone K.190 with Alfonso Mosesti and Arrigo Pelliccia, no less, and certainly seems to have known how to conduct Mozart. The same concert also had Milhaud’s Sérénade en 3 parties op.62, fascinatingly different from a Celibidache performance also in the RAI archives. And presumably there was at least one other work, but I don’t know what. There is an interesting essay by Erik Baeck, well translated, but may I chide Arts Archives over two little things? The exact names of the orchestras are as I have put them above, and the venue for the Milan performances wasn’t the “Auditorium RAI, Milano” because there isn’t one. Presumably it was held in the Sala Grande of the Conservatorio Giuseppe Verdi. The Milan concerts were held there for many years till, in the early 1990s, RAI’s contract with the Conservatorio was running out and a lot of public money went into the restructuring of the Teatro del Verme, which was to become the Auditorium the RAI orchestra had been lacking all these years. As the work neared completion, RAI disbanded the orchestra which never got to play a note there. It’s a very fine hall, by the way.